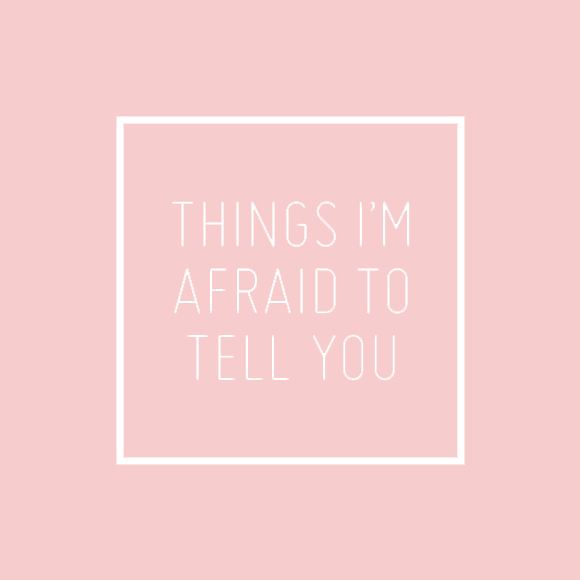 "things i'm afraid to tell you" has taken over the blog world this week. as far as i can tell, it all began with this post. you can google the term to read more posts, or visit creature comforts for a somewhat comprehensive list (i have a feeling it has grown exponentially since that post!). the subject of transparency comes up now and again in the blog world. do we share all of ourselves? do we only feeature the highlights of our life? comparatively, my blog is far less personal than most. friends encourage me to write more about myself and my life but if it were up to me i would just post images of cool snail mail and amazing art and write comments like "wow!" and "nifty!" one | sometimes i buy brownie mix with the intention of making brownies, but instead i eat half of it straight out of the box with a spoon. and then i can't use the leftovers because i can't figure out how to alter the other ingredients to make them come out right. two | i never clean the areas of my home that people (including me) cannot see. three | i want people to want to read my blog. i want people to notice that my blog is unique. art blogs with a more personal touch seem to be few and far between and i can't understand why nobody notices this, or why so few people are interested in the subject! four | i don't sleep very well and it's really starting to frustrate me. i never knew this was abnormal until i had a conversation about it with my husband. i literally didn't know that "sleeping through the night" was a real concept. i don't have insomnia like some people but i wake up at least four times a night, if not many more. five | i'm am so scared of death that sometimes, when i think about it, i cannot breathe for a whole minute. i don't believe in adventure, or crazy sports, or even walking on ledges or leaning over balconies. to me none of these things seem worth it - you'll experiences minutes of excitement but possibly die. six | i am very much ignorant of current events, politics, and the economy. i am mildly ashamed of this but i'm too open minded to feel passionately about them (yes yes except for arts cuts, i know) and for the most part they seem to depress people so do i really want to get on that bandwagon? seven | when something upsets me i let my emotions take over immediately. i cry or say harsh things - mostly to my husband. but then ten minutes later i'm completely over it! i need to learn to just count to ten, wait it out and then deal with it...if need be. during that period i shouldn't talk to people or make phone calls or write emails. eight | when i'm in public i am convinced that people are looking at my stomach. nine | i'm awful at understanding personal finances - mortgages, rrsps, debt and interest repayment. i just. don't. get. it. it doesn't seem to matter how often people explain it to me. don't get me wrong, i understand transactions and budgets and balance sheets. it's the investing and all that other stuff that confuses me. eleven | i cannot do one thing at once. i love working on a million projects at the same time but more than that i literally need to be doing many things at the same time. i write a blog post and watch tv and cut envelopes and play tetris. twelve | the amount of debt that we have scares me. i have to consciously stop myself from thinking about it because the stress is too much to handle. fourteen | i do strange little things that make me think i have some form of ocd. i 'control c' three times every time! fifteen | i hate bad spelling and grammar. not just little mistakes - everybody makes those! but when it's abhorrently bad i exit the blog, throw the resume in the garbage, ignore whatever they are trying to tell me and cringe. No, I don't despise you! I think you're really brave to put that all out there! I completely identify with a number of those things and I think others will too. doesn't everyone want the bigger half of the cookie? i usually have to wake up once (or twice!) to pee, so i rarely sleep through the night either. I think that worrying about our flaws is a good thing, otherwise we wouldn't strive for improvement at all. Plus when you're rereading this, don't your confessions seem rather mild and reasonable? I see nothing about harming cute furry animals or pushing wheelchair-ed people into the Inner Harbour, so I think you're fine. I am so with you on so many of those things. And don't worry...I love when you post about art, for sure. I can only wish I were more business and money oriented also. waiiitt... you eat brownie POWDER? haha whaaaat? and I too hate hate bad grammar!! :P were the SAME!! oh darling i love this! like the other comments here, i'm with you on a lot of these things. not so much the batter (but that's because i refuse to buy a mix, haha)... but i am terrified of my debt, i also wake up a lot at night (muscle relaxants help - though that's probably not good for you), i also want the larger half of the cookie (how will we ever split one?! ), and while i'm not too worried about my tummy, i'm convinced that people are going to think my tatas are floppy. floppy. Very nice post, and thumbs up to you! i really appreciated this response amy! i wish i could have emailed you my thoughts but your email is not hooked up to your blogger account :( glad we have so many similarities - it makes me feel a bit better! Your soul is so beautiful! Thank you for sharing. i feel exactly the same as number five! You are so similar to me! Thanks for sharing :) It's so hard to find people that feel the same way about #10. Sometimes I feel like I'm the only one, haha.